One faced Rudraksha or Ek Mukhi Rudraksha has one natural lining on its face. This bead is generally found in the shape of cashew or half moon. Though this bead is also found in round shape, but such beads are rarely available. This Rudraksha is most important and sought after Rudraksha amongst all the beads. 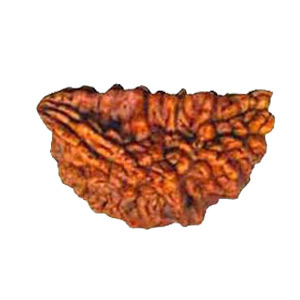 It is believed that Ek Mukhi Rudraskha removes the sins of past life. Sun is the ultimate source of energy for the living beings on the earth. It also denotes Soul. The ruling planet of Ek Mukhi Rudraksha or One Faced Rudraksha is Sun. If Sun is weak by virtue of placement in the horoscope, this bead helps in removing all the negative effects of the same. Ek Mukhi Rudraksha is considered a Divine Bead. A person wearing this Rudraksha enjoys all the worldly pleasures yet he remains detached from them. This bead not only gives worldly pleasures but also strengthen the spiritual power to its wearer. This bead provides leadership quality as such this is most beloved bead for the politicians or for those who want to excel in politics. Administrative heads and those who are in Government services are also benefitted by wearing this Rudraksha. The wearer gets the blessings of Goddess Laxmi who bestows wealth and prosperity to the possessor of this bead. This Rudraksha is also known to increase the confidence level. No enemy can harm the wearer of this bead. Sun is the significator of heart. This bead protects a person particularly against heart diseases where Sun is melefic. Other diseases controlled and cured by One Faced Rudraksha are headache, weak bones, general weakness and defective eyesight. This bead should be worn around neck in red thread or in silver or gold chain. No enemy can cause harm to the person wearing this bead .The person gets all pleasures of life. To get the maximum benefits from this bead, the above mantra should be chanted 108 times (One rosary) daily. The auspicious day for wearing this bead is Sunday.